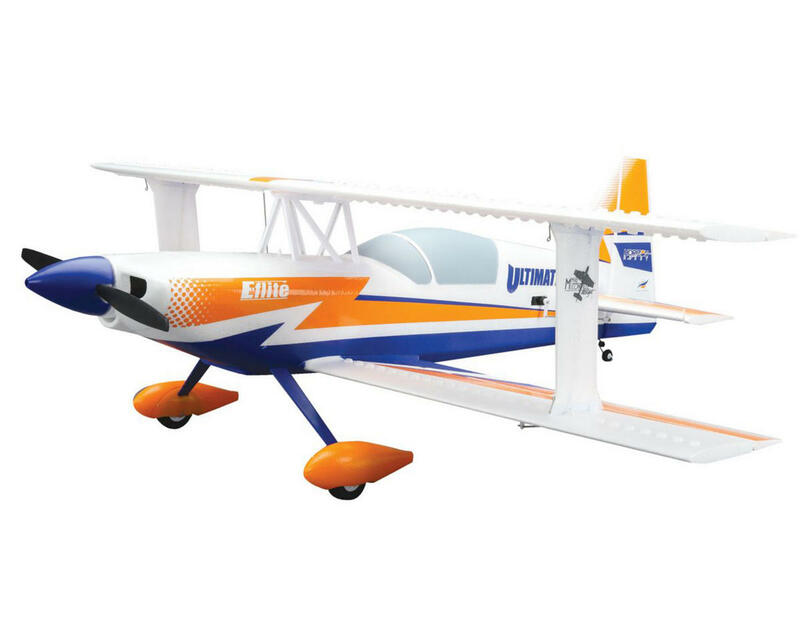 This is the E-flite Ultimate 2 Bind-N-Fly Basic Electric Airplane. World-class designer and pilot, Mike McConville, wanted to create the "ultimate" Ultimate park flyer. The original Ultimate biplane made a historic impression with the full-scale community, and the RC aerobatic crowd turned the aerobatic sensation into a blockbuster. Its revolutionary lines were unmistakable and the exhilarating performance it offered created a generation of aerobatic thrill seekers with a profound respect for airplanes with two wings. With the modern benefits of Z-Foam material and electric power, Mike was able to deliver a park flyer with everything the original had to offer, and more. 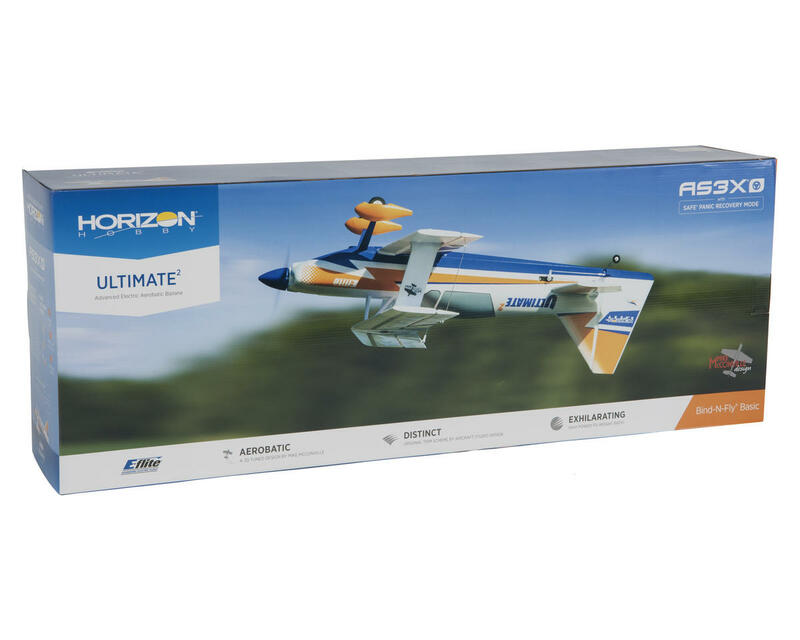 The E-flite Ultimate² biplane is the ideal choice for pilots looking for the ultimate in aerobatic performance. It’s a synergy of a highly-tuned airframe and modern aerodynamics, all complemented by a stunning trim scheme by Mirco Pecorari of Aircraft Studio Design. A high power-to-weight ratio, combined with high-quality components deliver a biplane with an aggressive 3D flight personality. Four enormous ailerons offer blinding roll speed while the massive elevator and rudder surfaces can make spin and snap rolls wild looking, yet predictable. The included AR636A receiver uses AS3X® technology that’s been specially tuned to give this great-flying airframe a whole new level of flight precision. If you don’t quite pull off a maneuver, Panic Recovery mode adds a virtual safety net that can return the Ultimate² to upright flight. Plus, the only gear you need to start flying is a full-range 6+ channel DSM2/DSMX Spektrum transmitter, a 2200mAh 3S 25C 11.1V Li-Po flight battery and suitable charger. AS3X Technology makes Aerobatics More Satisfying: The advanced AS3X® (Artificial Stabilization – 3-aXis) system built into the Spektrum™ 6-channel AR636A receiver is what helps give the E-flite® Ultimate² an incredibly solid look and feel in the air. It works behind the scenes to help counter the effects of wind and turbulence by combining 3-axis sensing with specially tuned flight control software. As a result, a highly-tuned design like the Ultimate² is made even better because your workload to fly smoothly is significantly reduced. In addition to AS3X, the Ultimate² includes Panic Recovery mode, a feature of SAFE® (Sensor Assisted Flight Envelope) technology that allows you to try new maneuvers without worrying about losing your airplane. Just push the panic button and the Ultimate² will instantly return to level flight. Tool-Free Field Assembly: With simple push-pin connections for the struts and one thumb screw in each wing, putting the Ultimate² together is a snap. AR636A Receiver: The installed Spektrum™ 6-channel receiver features uncompromised DSMX® 2.4GHz control, the amazing flight stability of AS3X® technology plus the SAFE® technology virtual safety net of Panic Recovery. Brushless Power: Under the sleek cowl is a powerful 10-size brushless power system that features the fast throttle response of 1250Kv wind and a 40-amp brushless ESC. 3D-Size Control Surfaces: Four enormous ailerons, massive elevators and a huge rudder help you enjoy instant response at even slow airspeeds. Vortex generators near the leading edge also enhance 3D performance. Z-Foam™ Material: Exclusive Z-Foam material makes it possible to create a design that’s lightweight and surprisingly durable. Any repairs are simple to make with just about any fast-setting glue.